This week the weather was pretty bad. Such a grey weather, cold, gloomy and wet. You could feel the cold in your soul. Grey clouds were hanging over the city creating an overwhelming atmosphere. Milan itself is a grey city but with this kind of weather it becomes unbearable. Few days ago it started to rain. And it rained. And it rained. What on earth could you do on such a weather? From the threshold of my kitchen I could see the big rain drops falling on the roofs of the buildings in the neighborhood…huddling clouds drifted by the wind , and from time to time the ring of a bell lost from the church across the street. I couldn’t go out that day. Felix was purring calmly without looking outside. What could I do? I had some things to do for work but I was not really in the mood. I felt like a school girl. Do you remember how it used to be when we were students and had homework to do on weekends? Any excuse was good enough to postpone doing it. Well, this is how I was feeling the other day :). I was looking at the computer trying to find any excuse not to start working. All sorts of things that needed to be done were passing through my mind. But after doing all I had to do, I didn’t have a choice: either start working or another good excuse to keep me busy for a while. And, what do you think! I felt like eating polenta! Oh, yeah, polenta! And this is how it started. Saved by polenta! I went to the kitchen and start working humming Cassandra Wilson …”I can stand the rain, against my window…” And inspired by the rain I decided to prepare a flavored polenta with fresh herbs and sun dried tomatoes. I adore sun dried tomatoes. I ate them every time I had an opportunity: in sandwiches, risotto, tarts, bread. 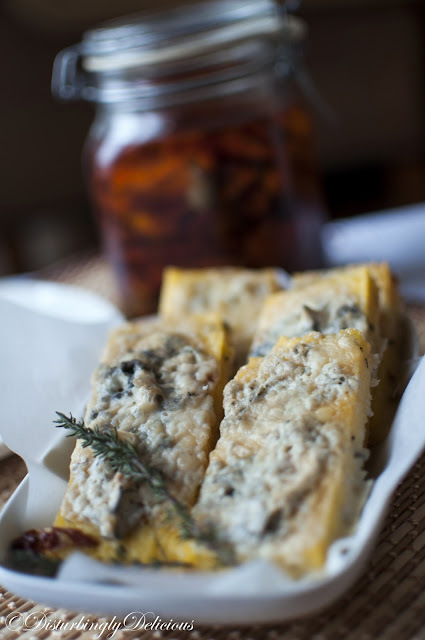 And having a good thought of it, I thought the some gorgonzola would be perfect for this recipe. 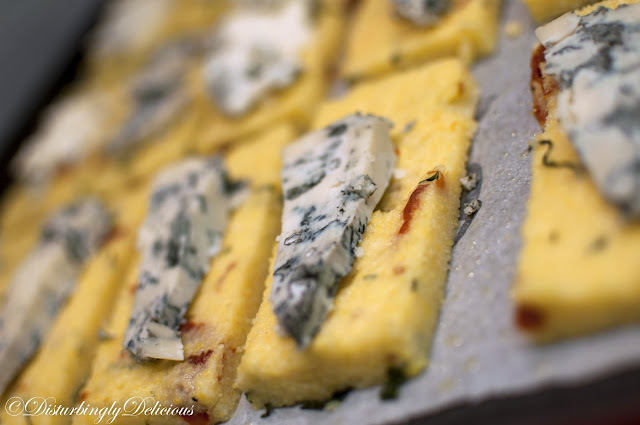 So, this is how the crispy polenta with sun dried tomatoes, herbs and gorgonzola was born. Wash and finely chop the herbs: 1 tbs of basil, 1 tbs of thyme, 1 tbs of rosemary; chop the tomatoes also:3 tbs of sun-dried tomatoes. Pour water in a big pan with the salt. When water starts boiling add the flour gradually stirring continuously with a strong wooden spoon until polenta thickens and begins to pull away from the sides of the pan. Follow the instructions on the package. The polenta I used didn’t need more than 10′ to be ready. When ready, add the parmesan cheese, the butter ( or olive oil), pepper, herbs and tomatoes and stir well. 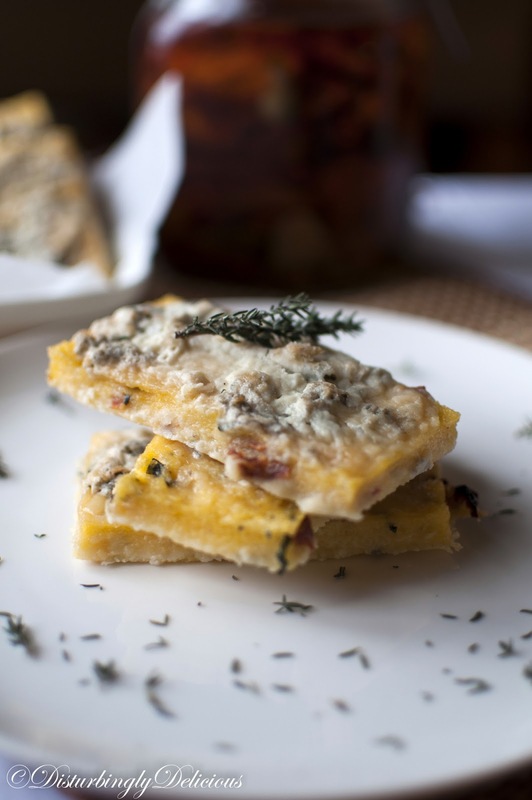 Spread out the polenta on a baking paper evenly. Let it cool for a while. 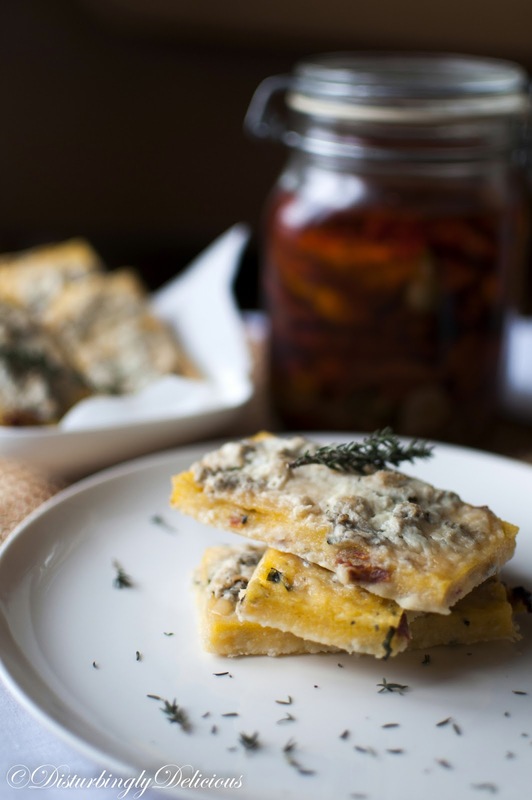 When cold, cut it in even rectangles ( cca 3cm) and add a triangle of gorgonzola on each rectangle. Bake the polenta in the preheated oven at 200° C for 10′-15′. Serve them warm but they are delicious even if cold. Of, și eu m-am plictisit de vremea mohorâtă de aici:(. Interesantă gustarea ta, Diana. Și eu am de gând azi să fac ceva dulce cu făină de porumb:). Vrei zapada?trimit eu cat vrei ca eu m-am saturat de ea. Clar pe gustul meu! !Imi place ideea! Foarte interesanta polenta ta. Am luat si eu o bucatica. Vremea bacoviana ma deprima,si sunt la fel ca tine fara chef de nimic si inventez scuze ca sa fug de responsabilitati,hahahah. Ce bine arata!!! O varianta deosebita! P.S. desi la mine e vreme frumoasa…tot n-am chef de lucru pt. job, nici eu! Eu sunt singura care mãnâncã brânzã albastrã asa cã tot timpul am bucãti in congelator; ce poftã mi-ai fãcut! Tare faina reteta!! Trebuie incercata! Oare merge si cu Roquefort? Cred ca da, deși Roquefort-ul e mai puțin cremos decât gorgonzola.